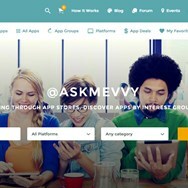 Mevvy helps you discover apps that matter to you, categorize apps by interest group. What is the license type of Mevvy? Mevvy is an Free Product. What are all platforms are supported by Mevvy?